I've never been happy with folks who figured out how to use HTML editors and called themselves "HTML programmers" since. HTML coding isn't exactly a science, it is relatively easy to comprehend. However, terms like "HTML programmer" make people think it's too difficult for them, thus making them use HTML editor software. That in itself is not the problem. The problem begins when people don't even realize later what this software does for them  and what it cannot do. In other words, not the use of editor software is the problem, the relying on it is. People start not to realize one can hand code HTML source. This initiative is meant to encourage to try. This document is not meant as yet another HTML how-to. There are enough of those. I'd just like to encourage, rather than assist, here. Anyway, I'm not an expert in HTML coding, so who am I to teach? So what do I want you to do? If this doesn't strike you as completely foolish, and if you code your HTML by hand, I'd like you to put a "100% hand coded HTML" link onto your page (or pages). The criteria of what may bear the logo and what should not are listed below. Note that they aren't fixed or clearly defined, and that they may and should be discussed. Read the following few sections, and then decide for yourself. That doesn't mean that I consider usability, portability, or correctness of HTML unimportant. In fact I'd like to see everyone writing their HTML to these standards. But they are not an issue here. Am I capable of coding my HTML by hand? Can I explain the purpose of each HTML tag on my homepage to a beginner? Do I try to learn about HTML what I need to know to achieve the results I imagine, instead of looking for software that does the task for me? What exactly is hand coded? This isn't strict in any way. If you use editor macros for writing HTML tags, no problem. If you use search&replace for umlaut characters such as ä, no problem either. If you use validation tools and other helpers, that's not only not a problem  I encourage you to. I do all those things myself, and I still consider my HTML hand coded. So can you. I'm pleased to hear that there still are more hand coders out there. You're very welcome to include one of the following logos on your page or pages. You may also alter one of them, or create your own  but in that case please do inform me at ermel@ermel.org so that I can put it up here together with the others. There aren't any GIF images here anymore; BurnAllGIFs.org explains why. The original logo by Erik Meltzer, solid white, for pages with a white background. JPG, 82*33 pixels, 1,707 bytes. PNG, 1,681 bytes, but looks odd on my browser. First logo by Axel Beckert, solid black, for pages with a dark background. PNG, 64*34 pixels, 1,894 bytes. JPG, 1,447 bytes. Second logo by Axel Beckert, solid black, for pages with a dark background. PNG, 60*30 pixels, 1,916 bytes. JPG, 1,413 bytes. Third logo by Axel Beckert, solid black, for pages with a dark background. PNG, 60*30 pixels, 1,760 bytes. JPG, 1,465 bytes. "Handmade" logo by Axel Beckert, transparent (I hope), for pages with a dark background. PNG, 60*30 pixels, 1,860 bytes. JPG, 1,446 bytes. The new logo by Erik Meltzer, grey 3-D look. JPG, 114*31 pixels, 2.141 bytes. The logo on top of this page may be useful for some purpose or other as well; it's here in the size shown above, 250*150 pixels, as either a PNG (30,494 bytes) or a JPG (11,477 bytes). A double-sized version (500*300 pixels) is also available, as either a PNG (84,504 bytes), a JPG (28,810 bytes), or in the Corel PhotoPaint 9 format CPT (201,509 bytes) with the three lines of text as individual objects. This is for the original logo  you should alter the link to the image and its size to match if you choose another one. Of course, again you'd have to alter the image's name, size, and possibly directory to match the one you copied and where you copied it to. 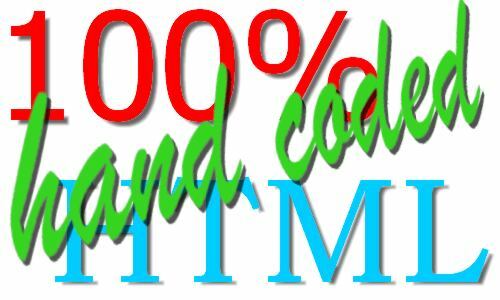 And of course, if your site is designed without pictures, you may also link here with only the "100% hand coded HTML" text instead of the logo. This initiative is quite old by now. I cannot quite remember when it first went online, but the logos on my hard drive are from 2000, and I'm sure it is quite a bit older than even that. Obviously, it has been somewhat less than a roaring success. But people still link to it after all these years, and although I've not invested much time in it, I still am, and will continue to be, interested. So please inform me if you decide to participate in this, and please include your page's URL so I can look at it. I don't mean to judge it or anything, I'm just curious. My e-mail address again: ermel@ermel.org. This section has been removed, because I couldn't find the time to keep it up to date anyway. Comments, flames, suggestions? Let me have it at ermel@ermel.org!